Automation is moving into new areas of work, and improvements in sensing and machine learning could accelerate as robots become more capable of taking on work that can currently be done only by people. Robots are already taking on ever more complex tasks within factories and warehouses. Indeed, the U.K. government is exploring whether robots may help it cope with a Brexit-induced shortage of labor. Beware robots bearing power tools. The robot shown here, called ARMAR-6, could be one of the most advanced robotic helpers tested to date. But it could also mark the beginning of further encroachment by robots into areas of manual work. ARMAR-6 can already respond to simple voice commands in useful ways. Ask it to hand you a wrench, for example, and it will ask which one before giving you the correct tool. Researchers working on the bot are also testing ways for it to parse a scene and plan complex actions in real time. In simple experiments, says a spokesman for the project, it can predict what a person is doing and respond proactively. In other words, the robot is learning to hand you that wrench before you even ask. Anticipating and reacting to the behavior of a human worker is particularly difficult, however, so it’ll be interesting to see how well the robot fares. The robot is being tested in one corner of a vast, heavily automated fulfillment center operated by Ocado, an online-only grocery store based in the U.K. Ocado led a seven-million-euro project, called SecondHands, to develop the underlying technology. The hardware and the dialogue system were developed in the lab of Tamim Asfour at the Karlsruhe Institute of Technology in Germany. 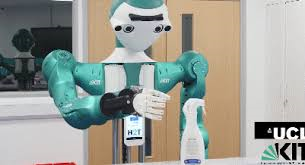 The robot’s vision system comes from Sapienza University in Rome and University College London (UCL).The robot is a sign of how rapidly automation is moving into new areas of work, and how improvements in sensing and machine learning could accelerate things. Robots are already taking on ever more complex tasks within factories and warehouses. Indeed, the U.K. government is exploring whether robots may help it cope with a Brexit-induced shortage of labor. According to a report from the International Federation of Robotics, an organization set up to promote the industry, the number of robots installed worldwide is expected to increase from 1,828,000 at the end of 2016 to 3,053,000 by 2020. Collaborative robots, or cobots, account for a small but growing proportion of these installations. Julie Shah and colleagues at MIT have shown that for certain tasks, like assisting on aerospace production lines, human-robot teams can be more efficient than either humans or robots working on their own. This dynamic may shift, however, thanks to the kinds of technology found in ARMAR-6, as robots become more capable of taking on work that can currently be done only by people. A robot might make a damn fine coworker, in other words, until it learns how to do your job.